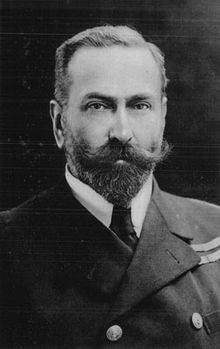 Admiral Louis Alexander of Battenberg resigns as First Sea Lord the day after his nephew dies of wounds on the Western Front. His resignation letter includes “I have lately been driven to the painful conclusion that at this juncture my birth and parentage have the effect of impairing…my usefulness to the Board of the Admiralty. I feel it is my duty to resign”. His German ancestry, titles, property and even his accent made him a target of the popular press and letters to the editor looking for a scapegoat for the Royal Navy’s lack of success to this point in the war. The First Sea Lord’s wife is even the sister-in-law of Prince Heinrich of Prussia, the Kaiser’s brother and grand admiral of the German Navy. Indian troops attack into Neuve Chapelle village, fighting house to house and hand to hand. Within hours a sustained German counter attack drives the Sikhs from the village. Of the two hundred eighty-nine men who manage to extricate themselves from Neuve Chapelle, only sixty-eight reach the road from which the attack has started. For his courage during the retreat Subadar Malla Singh will be awarded the Military Cross, the first Indian officer to be awarded the medal. In the ensuing six days of fighting, more than twenty-five British officers and five hundred Indian officers and men will be killed, and 1,455 wounded. The British force fighting its way along the railroad from Yapona reaches Edea, Cameroon two days after the French have occupied the town. Meanwhile Lieutenant Colonel Haywood with the 2nd Nigeria Regiment successfully fights his way up the Northern Railway and captures Susa. At 07:00 SMS Emden stops the British steamer Glen Turret after raiding Penang harbor. The Glen Turret is carrying explosives but instead of being sunk she is used as a messenger by Emden. The German captain apologizes to the survivors of a Russian light cruiser that he sank, for not picking them up. He also apologizes to the crew of a pilot boat for unintentionally firing on their unarmed vessel. Major John Stanley Richardson (commanding 21st Company Sappers and Miners, Indian Army) is killed at age 31. He is the son of ‘Sir’ Thomas and Lady Anna Constance Richardson and was a King Edward’s Gold Medal (1902) and King George’s Durbar Medal (1911) winner. He is one of five brothers who will lose their lives in the service of their King and Country four in the Great War after one was lost in a submarine accident in 1912. His mother is an author of religious pamphlets Prayers for Family Worship and Parish Meetings and A Simple Message to God’s Word. Major William Lynn Allen DSO (Border Regiment) is killed at age 43. He is a South African War veteran and son of Bulkeley Allen JP. Major ‘the Honorable’ Hugh Joseph Fraser MVO(Scots Guards) is killed at age 40. He is the son of Simon Fraser MVO, the 13th Baron Lovat and he served as the ADC to the Viceroy of India from 1910-1913. Captain Rowland Latimer Almond (Sappers and Miners, Indian Army) is killed at age 27. He is the first and youngest of three brothers who will be killed. Captain Robert Frederick Balfour (Scots Guards) is killed at Gheluvelt at age 31. He is the son of Edward Balfour JP DL and great grandson of the 1st Earl of Cawdor and his brother will be killed in March 1918. Captain Edgar Wilmer Walker (East Yorkshire Regiment) is killed at age 39. He is the son of Admiral C F Walker and grandson of ‘Sir’ James Walker Baronet. Captain Robert Jim McCleverty (Sikhs) is killed at age 32. He is the grandson of General W A McCleverty and Surgeon General H H Massy CB. He fought in the South African War and is a hockey player. Captain Eric May Battersby (Royal West Kent Regiment) is killed at age 30. He is the son of Worsley Battersby JP. Captain Edwin John Berkeley Hayes-Sadler (Royal Engineers) is killed two days before his brother is killed. They are sons of Lieutenant Colonel ‘Sir’ James Hayes Sadler KCMG CB late Governor of the Windward Islands. Captain Alexander Kennedy(Royal Irish Rifles) dies of wounds received four days earlier. He is the son of the late General H F Kennedy (King’s Royal Rifle Corps). His wife is the cousin of ‘Sir’ Aylmer Hunter Weston KCB DSO. Captain Bertram Lawrence (East Yorkshire Regiment) is killed at age 37 when he is shot by a sniper. He is the grandson of General Henry Lawrence and a veteran of the South African War. Captain Charles Almeric John Cholmondeley(Border Regiment) is killed at age 34. He is the son of the late Lord and Lady Cholmondeley and the grandson of the 3rd Marquess of Cholmondeley. Captain John Mounsey Lambert(Northumberland Fusiliers) is killed at age 30. He is the only son of the late Major General G C Lambert. Lieutenant James Booker Brough Warren (Border Regiment) is killed at age 25. He is an international caliber high hurdler. Second Lieutenant Ronald Charles Melbourne Gibbs (Scots Guards) is also killed at age 21. He is the son of the late ‘Honorable’ Henry Gibbs, grandson of General Charles Crutchley and nephew of the 2nd Baron Aldenham. Second Lieutenant Clarence Leslie Bentley(Manchester Regiment) is killed at age 20 when he is shot in the head by a sniper. He is the son of the late Alderman William Bentley JP. He passed out of Sandhurst as war was declared. Second Lieutenant Richard Mary Snead-Cox(Royal Scots) is killed 8 days after his brother has been killed when he is shot in the chest while another brother will be killed at the Battle of Jutland. CQMS Ernest John Thompson (Grenadier Guards) is killed at age 30. His brother was killed yesterday. Sergeant Major Sydney Barnard Thompson (Lancers) is killed at Messines a day before his brother will be killed at Ypres. Lance Corporal Edward Alexander Guess (Royal West Kent Regiment) is killed at age 20. He is the middle of three brothers who are killed in the Great War. Brothers Jim and Tom Pumfrey are killed in action while serving as privates in the South Staffordshire Regiment. Private Arthur Holdssworth (East Yorkshire Regiment) an archaeologist is killed in action. He is the father of wildlife documentary filmmaker Michaela Holdsworth Denis. Private Frank Lawes (Royal West Kent Regiment) is killed at age 18. His brother will die of wounds in March 1918. Private Richard Banks (Royal West Kent Regiment) is killed one week after his brother met the same fate. Private John Haines (South Staffordshire Regiment) is killed at age 26. His brother William will also lose his life in the war. Colonel Bertram Charles Percival Heywood(Manchester Regiment) dies at home at age 49. He is the son of ‘Sir’ Thomas Percival Heywood, the 2nd He served in the South African Campaign. A British Naval Flotilla continues to support the Allies left, and since the morning of the 27th the fire of 12in. guns has been brought to bear upon the German positions and batteries. The reports received from shore testify to the effect and accuracy of the fire, and its strong results. The flank is thus thoroughly protected. The enemy brings up heavy guns and replies vigorously to the fire from Admiral Hood’s ships. The vessels receive no structural damage. The casualties are slight throughout, but one shell explodes on the destroyer HMS Falcon killing her commander along with seven other men. Lieutenant Hubert Osmond Wauton is the son of the Reverend Atherton E Wauton age 29. Able Stoker Petty Officer Charles Arthur Beaney killed at age 38. His brother was killed last month in the sinking of HMS Hogue. Able Seaman William Skye is killed at age 24. His brother will die on service as a leading aircraftman in the Royal Air Force Volunteer Reserve in 1946. The fishing vessel Our Tom (Skipper Albert R Larkins) is sunk by a mine 45 miles southeast from Southwold. Her skipper and two crew men are killed.